Before you start reading this article, let us preemptively state that we know how frustrating learning new web features can be. Some people are all about the latest technology and just love adding new updates to their devices, while others just wish we could still use typewriters, for goodness’ sake! If you’re on this website, we’re going to assume that you at least fall somewhere in the middle. We’re here to tell you that, while we might cringe every time we get a notification for a software update on our iPhone, we really do believe that keeping up with new available features for our clients’ websites will save everyone time, money and sanity in the long run. 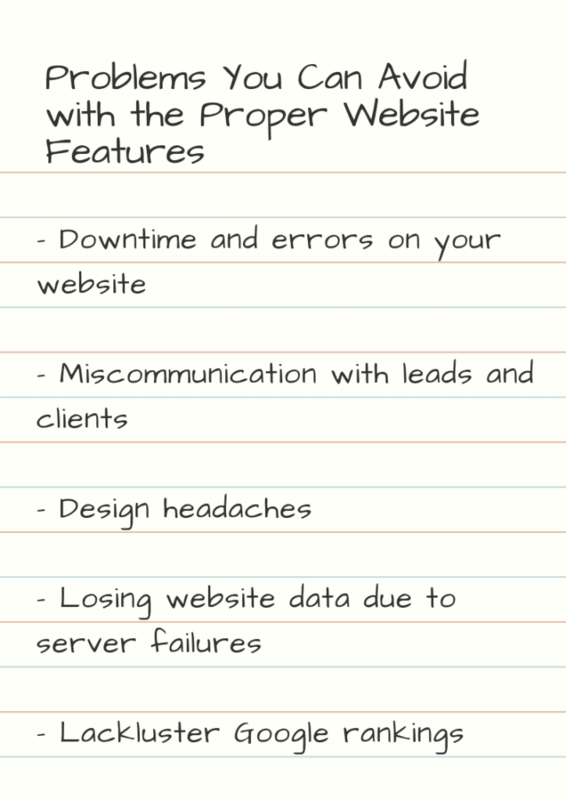 And because sifting through the literature on website features can be daunting (and boring), we thought we’d help you out by compiling our 8 favorite (and what we consider indispensable) website features that you really do need to take seriously if you want to see your business grow and prosper in the 21st century. Have you ever made an update to your WordPress website only to get a big fat error screen? It has happened to us in the past too! This might not be such a big deal if you have a website with very few visitors. Take 1 or 2 hours, fix the bug, and you’re good, right? Well, what if your website has hundreds or thousands of visitors at any given time? How well do you think they’ll respond to your broken site? Probably not very well. Even worse, what if your site has e-commerce functionality and visitors are impaired from checking out and buying your products while your site is down? Not a good situation to be in! This is where staging sites come in. A staging site is an exact replica of your site, but it’s not live. On this duplicate version of your site, you can test changes to make sure they work with your existing tech stack. Once you’re positive that the change isn’t going to break your site, you can push the changes on the staging version of your site over to the live version. In 2018 we implemented staging sites on all the sites we manage. Anytime we update a plugin or theme on your site, or even a big content update, we test everything in a staging environment before making the changes on the live site. This has drastically reduced downtime, errors, and given us much greater peace of mind. For the vast majority of us, the main purpose of our website is going to be lead generation. That is, the goal of the site is to inform more people about our organization, products, and/or services, so that we get more business. Consequently, a good lead-generation website needs to have a clear call-to-action and a lead generation form, at minimum. But where do all those contact form submissions go? The quick and dirty method is that they go into your email inbox, after which you need to mark those emails and follow up with them later. But when you think about it, this is a “junior varsity” solution at best. Deliverability. There’s a good chance that email sent from your contact form ends up in your spam folder. If you set up your Gmail or Outlook inbox properly, this is much less likely to happen, but it’s still a possibility. This problem is compounded by the fact that most free contact form plugins don’t store the form submission data in your website’s database. If the message gets lost between your website and your inbox it’s gone for good, leaving your lead wondering why the heck you never followed up with them. Lack of Automation. If the contact-form-to-email method does succeed, then what? Do you have a system in place to make sure no leads get lost in the shuffle? What if you get 50 form submissions a day? It’s highly likely that you’ll forget to follow up with at least a couple of those contacts if you don’t have a rock solid follow-up method in place. Enter the glory of CRM. Using a CRM software tool is just good business practice in our opinion, and one that sets your business/organization up for success from the start. If you don’t know what a CRM even is – oh boy – prepare for an “ed-macation!” CRM stands for Contact Relationship Management. At minimum, it helps you manage your contact records and segment them into various lists. Beyond that, let’s just say that using a CRM is the second best thing you can do for your small business behind owning your own website. Help you project sales and track where various leads are in your sales pipeline. Remind you to complete various tasks, such as following up with leads or customers. Log activities you completed with customers and leads. Integrate your various points of contact. Think emails, phone calls, Facebook messenger, etc. Helps sales teams of more than 1 person understand what communication has occurred between a lead/customer and other members of the sales team. Needless to say, CRM is really, really cool. But, it’s even better when combined with marketing automation. According to Hubspot, “Marketing automation refers to the software that exists with the goal of automating marketing actions. Many marketing departments have to automate repetitive tasks such as emails, social media, and other website actions. The technology of marketing automation makes these tasks easier. ” (source: https://www.hubspot.com/marketing-automation-information). From my perspective, the value of marketing automation is that it provides a one-platform solution to manage your marketing and sales campaigns together. If you’ve been around digital marketing for a while, you may have an email marketing provider, a social media automation tool, 10-15(!) social media accounts, SEO tools, an e-commerce tool, an invoicing tool, an analytics tool, a live chat tool, a push notification tool, and a CRM. Yes, it becomes a freaking nightmare really quickly! A marketing automation tool is not just necessary to have all these accounts in one place. The real value lies in that it allows all these different pieces of software to talk to each other. For example, imagine you’re a small business with physical products and your e-commerce platform didn’t talk with your accounting tool. D’oh! You’d probably have no idea how much inventory you have on hand after just a short period of time! Why spend hours trying to reconcile all that when you can have a tool do it for you? Another example: Let’s say you provide a service and you recently began emailing a lead from Gmail. Later on, you figure out that your lead’s preferred method of communication is Facebook Messenger. So you start another string of messages on Messenger. Let’s also say that you’re the business owner; you get really busy one day and have to pass on the sales process with this lead to one of your employees. How is that employee supposed to know what you’re doing? It only makes sense to house all your contact records within your CRM, so other people involved in sales and marketing can collaborate together. Use Hubspot. They have a great free CRM with limited marketing automation tools you can get started with. Once you’re successful with their free version, you can always upgrade to a paid plan. Sell online and at your place of business. Use Square. Square will help you manage your customers, process payments, track orders and inventory, and it integrates with your online sales. On top of all that, you can even do email marketing with Square! Square is kind of like integrating your CRM, payment processing, and POS in one step. A word of caution about Square: Not all Square integrations are created equal. If you’re trying to set up an e-commerce shop, Square provides you with many options. So far, Square does not integrate that well with WooCommerce, which is a popular WordPress e-commerce solution. We’re also not that hot on setting up your website on Weebly, which is Square’s official recommendation at the moment. You really don’t want be stuck with a website on Weebly, which for many will be an insufficient platform as they scale up their business. (1) Use a native Square Checkout page. In this case you’d have your own native website with page, products, buttons, and everything. Then you’d redirect from a page on your site to a checkout page on squareup.com where the customer would then pay and complete their checkout. Check out Square’s documentation on this subject for more information. (2) Integrate Square with ECWID. ECWID is a really simple e-commerce solution because it works great with WordPress and can process payments via Square. It’s also really affordable. All you have to do is set up your online store and products within ECWID, select Square as your payment processor, then integrate ECWID with your website. You can read more about the ECWID and Square integration here: https://squareup.com/us/en/app-marketplace/partners/ecwid. Use Infusionsoft. It’s incredibly powerful and allows you to send emails using their visual email campaign builder. You can use all sorts of conditional logic to determine who gets what email. You’d think that e-commerce would be a staple feature of every website. Having the ability to add products to a shopping cart then checkout with a credit card is very much a common experience of our everyday life. But the truth is that you probably make purchases on much larger sites than your day-to-day, small business website. Smaller website developers who service smaller business owners typically focus on what is called a “lead generation website.” That is, the goal of the site is to generate leads; actually turning those leads into customers and accepting payment is something that happens later, off the site with a point-of-sale or invoicing/accounting tool. There’s nothing wrong with lead generation websites because most people are not going to want to deal with the added layer of complexity that E-commerce brings. I can’t blame them. Yes, e-commerce is a pain, it’s expensive, it’s much more difficult to execute than your typical lead gen website. But, we’ve got a solution that’s much easier to implement than your typical e-commerce solution (i.e. Woocommerce). It’s called ECWID. ECWID is inexpensive. They only charge you an ongoing subscription fee (as low as free, but you’ll likely pay $10/mo), not a percentage of each sale like EVERYONE ELSE (Shopify, Big Commerce, Stripe, etc.). This is important if you have products that cost $500 or more. ECWID offloads your shopping cart. This means fewer things that can possibly break on your site, because your shopping cart is hosted externally. ECWID makes it easy to add new products, update existing products, or remove products. Logging in to ECWID is very easy for novice users, especially in comparison to updating your shop within WordPress (as is the case with Woocommerce). Because ECWID is not restricted to the WordPress environment, it’s flexible enough to run it on other platforms (specifically as Ebay and Facebook stores). You are not restricted to only selling on your website. What’s more, your store can sync between several online platforms all at the same time. No need to try to reconcile inventory by hand later. Awesome Mobile App. Want to manage your online store on the go? ECWID has a fully functional mobile app, while the Woocommerce app is still in beta. * Note that the ability to edit Woocommerce pages with some page builders was recently added. However, you can still only customize certain Woocommerce specific elements even with the page builders. You cannot add absolutely whatever you want. See the Elementor and Divi releases on the subject. If you’ve owned your own website for a while you probably know that you need to run backups consistently in case anything ever happens to your site. In fact, before I had staging sites, I had to revert to a backup on tritheos.com several times. Fortunately, our preferred host, Flywheel, creates a back up of your site every day, so you’ll never be left hanging. But let’s say disaster strikes and all of your host’s servers go down…for good! Or worse yet, what if your website host went off the rails and locked down access to your site completely? Well, they’d take your live site AND your backups with them. What are you going to do then? It’s just good practice to have someone besides your host also take backups of your site. In 2018 we added a service that allows us to make daily off-site backups of your site. Anything short of a nuclear war will not stop us from getting your site back! You basically have to keep scrolling and scrolling and scrolling, and maybe…hopefully…you’ll find the image you were looking for. You can imagine the headache and clutter this is going to cause. 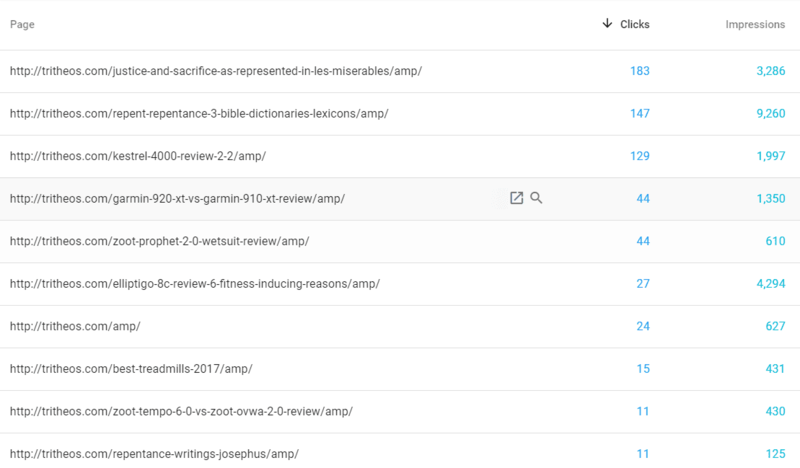 I consider the lack of media library folders to be the greatest drawback of WordPress. That’s why Media Library Folders is probably my favorite feature addition in 2018. The advantage is evident. There’s no need to sift through hundreds or thousands or uncategorized media items. You can easily drop all your images, pdfs, logos, and other media items into folders of your choosing. With the media library folder solution we provide, you can even upload files directly from Google Drive or Microsoft Onedrive. This means you don’t have to download files to your hard drive and then re-upload them to WordPress! Pretty cool. I’ll admit that I’m pretty resistant to change, so when I first saw live chat starting to pop up on other websites, I thought to myself, “what a stupid concept; why would I ever use this? !” Of course, I also said that about texting and smartphones (both of which are still stupid for the most part but have their place, by the way). Calling customer support still seemed like a better option to me at the time. It took me a few months, but now I love the live chat feature you can find on many websites today. People can communicate the specific questions they have at the exact time they are browsing your website. For instance, I’ll often ask company reps on live chat about a feature I couldn’t find information about, or if I misunderstand their user-interface, they can direct me to the pages I need to find information about. From a marketer and designer’s perspective, when people have questions they couldn’t easily find on one of my websites, this means I probably need to make changes to my website and potentially add more information. It’s like free website usability testing and conversion optimization. Live chat is less of a commitment than calling or emailing sales or support. According to SuperOffice.com, over half of customers now prefer using live chat over phone support. In addition, live chat is now the leading digital communication method as well. I can’t say if live chat is right for you and your business. It does take commitment in that, generally, someone needs to be available to operate your live chat during the hours you choose. Still, it is an extremely easy way to help your leads move further down the sales funnel, as well as provide better customer service. We love developing sites in WordPress, but to be honest, manipulating headers and footers has never been an easy thing. These areas of your site are typically controlled by your WordPress theme, and oftentimes there is not much control over the design and ability to customize your header or footer. Why would you even want to customize your header or footer? My thoughts on this typically go back to your website user and being able to answer their questions as quickly as possible. For instance, sometimes adding a phone number and email address up above your primary navigation can be a good way to make it easy for people to reach out to you. Similarly, if someone can’t find what they’re looking for in your primary navigation, they will often look for the link in your footer menu (I do this all the time!). Another reason would be to achieve all of the above, without sacrificing consistency with the rest of your site’s design. Using our site builder of choice – Divi – we now have 100% design control over headers and footers. 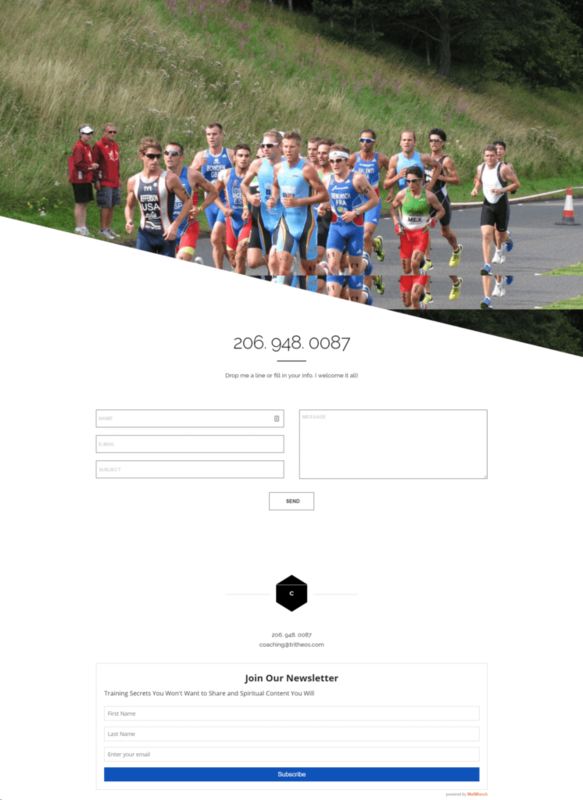 Here’s an example of a footer we recently built that includes a slick email opt-in. This is a feature we don’t want to abuse, however. Following some tradition when creating headers and footers is a good thing. If your header is more a piece of modern art than a functional element of your website, what good is that? There are few shortcuts in SEO, but it’s wrong to say that there are none. One big shortcut to getting better rankings in Google is to provide an AMP version of your blog posts. AMP is short for “accelerated mobile pages.” It’s basically a stripped down version of a page on your site, with the absolute minimum in design applied to the page. This means that the page can also load super quickly. Before you freak out about putting an ugly page of your site onto the internet, remember that these pages will only be served to mobile users. Most of the time mobile design consists of a simple, one-column format anyway. So what kind of results can you expect from creating an AMP version of your site? Here’s a screenshot of the amount of clicks I received to my AMP pages from my triathlon coaching site. All told, I received 635 clicks from my AMP pages over a 3 month period. That’s pretty good for a one-man site! The point of having AMP pages is: If your page loads faster, Google will prefer that page because Google values speed. Consequently, Google will reward you with higher rankings. Do you offer staging sites so that when you are updating my site we can both be assured that it doesn’t break? Do you offer CRM integration, so I can get marketing and sales results from the site? Can you get e-commerce functionality without me having to spend $20k? Are you doing off-site cloud backups so that if something should happen to my host’s servers, we can always retrieve a backup of my site? Do you have media library folders so that I don’t have to sift through media items from 2015 in order to update my site? Can you get a live chat feature on my site? Can you make my header and footer look exactly the way I want it? Really? If I really need SEO results, are you willing to go the extra mile and install additional code I might need to succeed? We think the features we added in 2018 are pretty cool, but on their own they do pale in comparison to what we have always offered: a website marketing and content strategy to ensure your site gets results, local SEO so you can rank higher in Google and get traffic to your site, SEO copywriting services to clearly demonstrate the benefits of your products/services to your target audience, results-driven web design where we optimize your site for business results first and aesthetics second, and ongoing marketing services such as email marketing, social media, content (blog) writing, and SEO campaigns. While we always strive to provide the latest and greatest features to our clients, out core offerings will never change. Hi guys! Matt Sheeks here. I’m just starting to do some video marketing and I hope you find value in what I have to share. All of this begs the question about your own digital marketing. No Google My Business page? Vague marketing speak in the headline of your website? A Facebook business page, but no email marketing list or campaigns? No email opt-in on your site? No search engine marketing strategy? If you have any of the above online marketing flaws, you’re already way behind. But that’s okay, I’m sure your competitors love it. Allright, maybe it’s not okay. Maybe it’s time to fix it. “New-Year-New-You,” right? But how do you find the time to do online marketing all by yourself? Just because it’s a new year doesn’t mean you all of a sudden have more than 24 hours in a day. Lemme tell you, it took me forever to figure out which marketing activities actually worked, and which ones were aimed at funneling me into someone’s get-rich-quick scheme. But, you don’t have to start from scratch like I did. If you just invest the 6 minutes before your next meeting to watch this video, you’ll be miles farther along than you were 6 minutes before. If you follow these seven tips, you’ll experience increased ROI. You’ll experience more online leads and revenue. Your social and website will begin to work for you instead of, well, just sitting there. Bottom line, we want to help you market your small business online simply, affordably, and for you to get results. So check out this video. Have you ever wanted to move beyond marketing theory and into what it takes to successfully market a small business online? Our Digital Marketing Strategies and Tactics course will help your business develop new leads and customers in order for your business or organization to grow. This article is to designed to help you navigate our course. 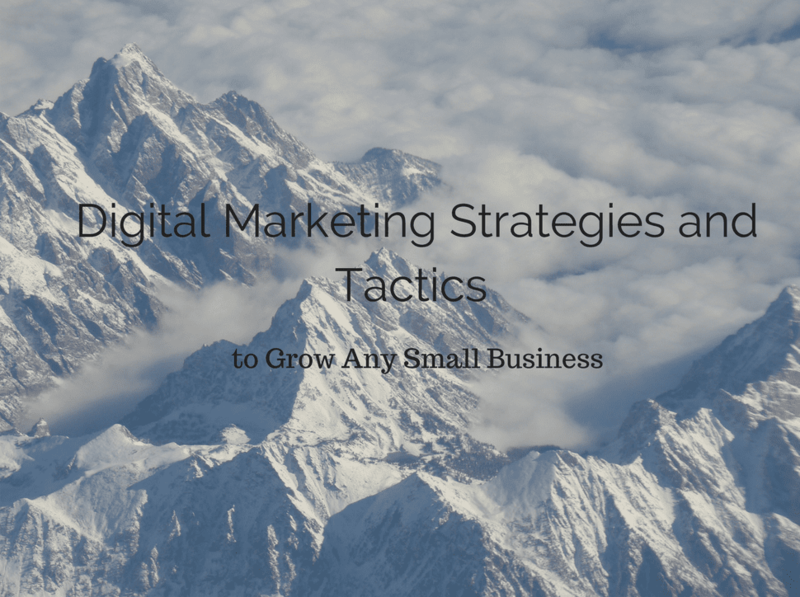 The Digital Marketing Strategies and Tactics to Grow Any Small Business course is divided into 10 modules per term, for a total of 3 terms. This follows the conventional quarter system course schedule. During each term the course is available in-person in the format of one, 1.5 hour class per every month, with approximately 1.5-2 hours of coursework which can be immediately applied to your business. The winter term begins January 1, 2019, and ends July 9th, 2019. Specific course schedule and registration can be found by using my contact form. How to Write Persuasively to Clearly Demonstrate the Benefits of Your Product or Service. What is WordPress and Why is it the Best Platform for Small Businesses? The course then repeats the same subjects for the following terms. Think of each term as proceeding from beginner, to intermediate, to advanced for each subject. Several reasons exist for why small businesses need to invest time, effort, and even dollars into online marketing efforts. Some of these are obvious, such as the increase in computer and smartphone usage to research businesses and ultimately make buying decisions. But some of the strengths of digital marketing may be less obvious to the unaccustomed. 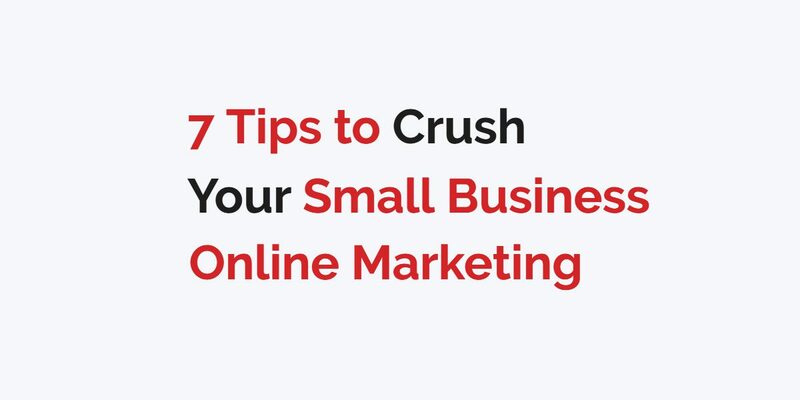 Let’s dive into the top 7 reasons small businesses should get busy with their online marketing. Five of these reasons are conceptual in nature, while the other two refer to trends in consumer behavior. The first five will always be true, while the trends we have noticed (as of 2017) may change over time. 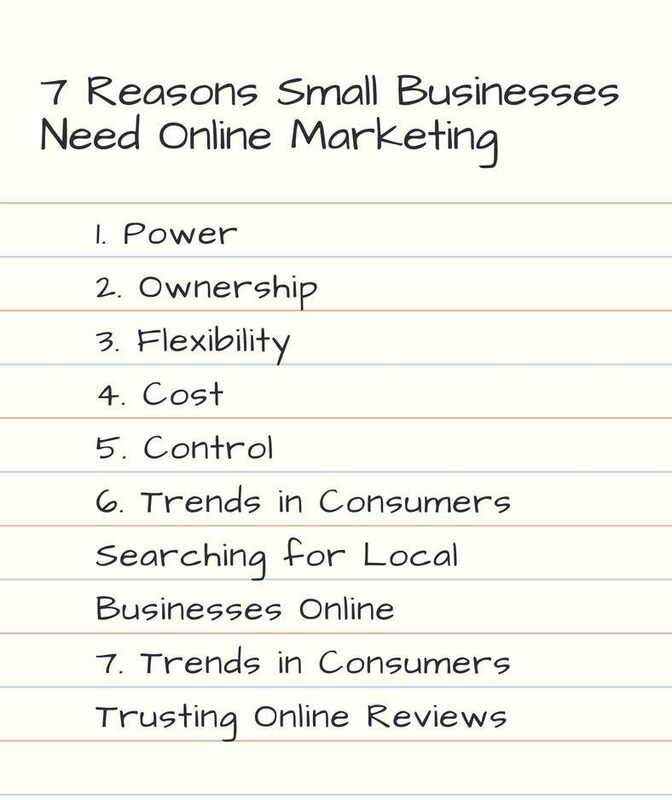 Five concepts drive the need for Online Marketing: Power, Ownership, Flexibility, Cost, and Control. It will be noted here that these concepts are applicable only to the method of marketing espoused in this course. There are any number of online marketing strategies which can be employed which do not fit where the above concepts do not fit (online gambling marketing, marketing with a heavy emphasis on paid advertising, black hat SEO, etc.). We can define the method espoused in this course as: content marketing based primarily on one’s self-hosted website, where traffic is driven primarily by Search-Engine-Optimization, organic social media and influencer marketing. No one can debate the power inherent in presenting information in an an online format. Certainly, creating web content takes a lot of time, but your efforts can be multiplied because of the ability to reach a worldwide audience. Representing your business online is similar to being in two or more places at one time! Many of you are familiar with the concept of an elevator pitch. Imagine being able to give the elevator pitch for your business to only one person. Now imagine giving the same elevator pitch to a group of ten in the same elevator. Now, imagine giving an elevator pitch to 10 people in 100 separate elevators located in 100 separate countries. Finally, imagine giving an elevator pitch to 10 people in 100 separate countries, yesterday, today, tomorrow, and for the next 100 days, but only having to give that elevator pitch one-time. Such is the power of having content related to your business available online. Another powerful element in digital marketing (hence the term, digital), is the ability to deliver the message in multiple formats. Text, audio, images, infographics, video – all of these are preferable to different audience members at different points in time. Personally, if I’m really intent on learning something quickly, I will gravitate towards text-based content such as blog posts, articles, online tutorials, etc. I can easily find the information I want by scrolling the content and looking at sub-headings. Many times, I will read the article in its entirety, if I have time. It’s also easier for me to return to the same article in order to re-read, cut-and-paste, or reference a certain section. This is currently much more difficult to accomplish with audio or video. If I’m driving, audio, specifically podcasts, are my preferred method of consuming content. I can turn my car into a rolling University, maximizing my time in the car so I can focus on producing content when I am stationary and at my desk. However, if I want to be entertained, perhaps while eating a meal, I will gravitate towards video. I have to interact far less with content. Video is slightly more passive, it seems, in that I can let the information come to me. As an added bonus, I rarely have to touch the trackpad of my laptop with dirty fingers! If you think about paid advertising, it can usually be accomplished because the other guy – the one charging you – is delivering content in order to drive eyeballs to whatever medium he controls. Newspapers could be considered one of the oldest forms of content marketing. Because people are willing to look at and read the newspaper, this opens up the opportunity for the newspaper company to be able to charge for space within the newspaper. You pay for access to their audience. Similarly, companies that operate billboards have some sort of control over the land where the billboard is located. This allows them to charge for space on a sign in an area that is highly trafficked. Finally, we have pay-per-click advertising. Paid advertising only exists because people want access to the organic or unpaid results found in search engines. Indeed, according to Rand Fishkin of Moz, about 90% of the clicks go to the organic (or unpaid) results. While there is profit to be had in pay-per-click, the attractiveness of optimizing one’s site for the organic listings, a practice known as Search-Engine-Optimizaition, is undeniable. When you own the platform, no one can charge you for the placement of your message. At a minimum, you’ll need to pay for a budget website hosting plan (~$5/month) and possibly a premium WordPress theme (~$50/one-time). If you create content, there might be costs involved in the creation of the content itself, but no one can charge you to place the content on their medium. It’s only your time and effort involved. This segways nicely into the 3rd concept we need to look at when discussing the advantages of online/digital marketing. Once a website or other piece of content exists, there are multiple ways to utilize our platform of choice, which is a website. All of the modules in this course – Copywriting, SEO, Email Marketing, Web Design – all seem to work in harmony to get results for the website owner, whatever the owner’s objective may be. Personally, I certainly use my website for purposes that have a clear financial outcome. But I also use it for causes which I believe in deeply and which give me no monetary gain. In addition to multiple types of website utilization, there are multiple ways to promote the message of that website or page. We’ve already discussed SEO, the practice of making webpages more amenable – simultaneously – to human web users and to the search engines themselves. This is an immensely practical way of driving traffic to a website because of the minimal upkeep needed to continue driving traffic. But there are yet other ways to drive traffic to a website or piece of content. Social Media, E-mail, and even Paid Advertising come to mind. Even print advertising can drive a good deal of direct traffic. The simplest way to think about owning a website and performing content marketing is to think about renting versus owning a home. When you purchase a home, you pay one amount (although you may have a mortgage payment! ), and can continue to utilize the benefits of the real estate as you please. With renting, you make recurring payments and are bound to the stipulations provided by the owner of how you may use the property. This is very similar to owning your online content versus renting. If you advertise on someone else’s platform, let’s say it’s Facebook Advertising, you pay them on a recurring basis and they dictate where you can place the ad. If you create your own content on your own property, you can continue to derive benefits from that piece of content in a residual fashion. Within all 4 of these elements is the concept of control. When the message and content is produced on your own property, you have more control over the outcome traffic and conversion of the traffic. When you build your “house” on someone else’s foundation, whether that be Facebook, LinkedIn, Google, etc., they make the rules and can change the rules at anytime, leaving you as the business owner and content creator in the position of having to pivot. One can’t help but think of the mass demonetization of Youtube channels recently that were deemed too politically controversial by Youtube. When you own the web-property, you still have to pivot with changes in technology, the economy, and in your own industry, but these changes can be made according to your own schedule. Of course, you don’t need to memorize or even know these concepts in order to start taking advantage of content marketing. I certainly didn’t when I started out. But knowing the advantages of digital marketing can certainly influence a business’s willingness to stick with their online marketing efforts. Now let’s look at emerging trends in consumer behavior that make digital marketing even more attractive. 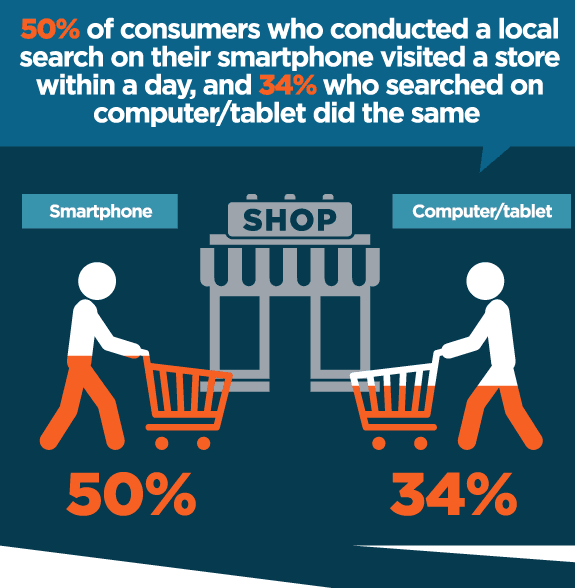 Currently, consumers are searching for information about local businesses at a rate that outpaces the amount of information given by the businesses themselves. This creates a massive opportunity for small and/or local businesses that decide to get savvy with their marketing efforts. The value of online reviews and the effect it can have on small businesses is staggering. Yet, it is perplexing that local businesses place so little value on online reviews. 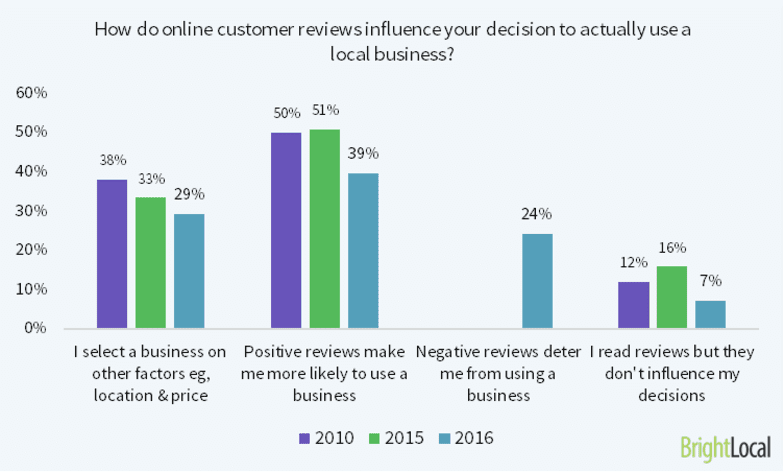 According to a 2016 survey conducted by Bright Local, the seminal surveyor on the topic, 50% of consumers regularly check online reviews for local businesses, 41% occasionally check online reviews, and only 9% do not check online reviews. So, in total, 91% of those surveyed check online reviews at least some of the time. 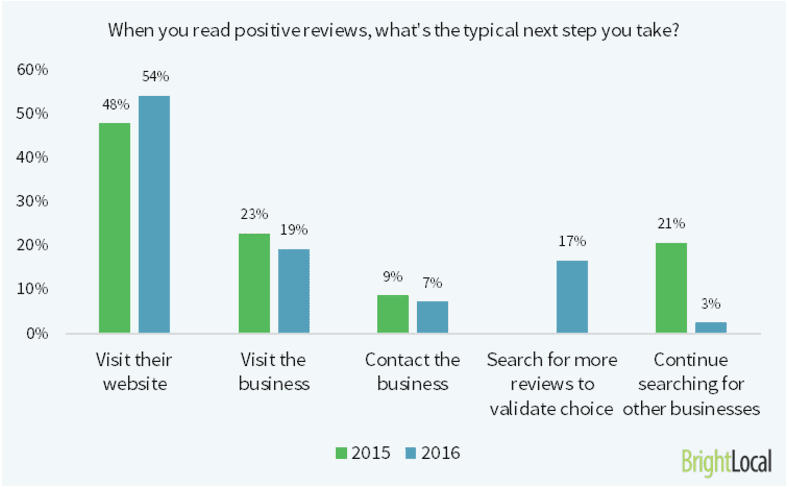 In addition, 39% of people claim that positive reviews make them more likely to use a business, while 24% claim that negative reviews deter them from using a business. Among the most popular types of businesses that consumers sought reviews for include: (1) restaurants (60% of participants searched for), (2) Hotel/B & B (40%), and (3) Medical/Healthcare (31%). 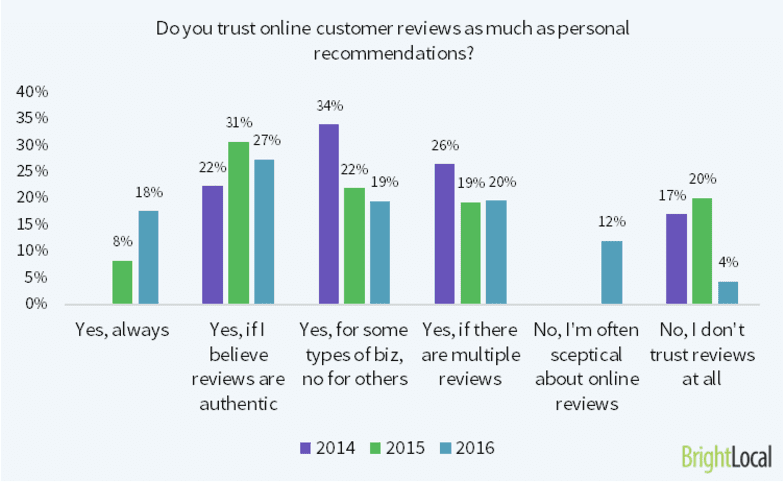 These numbers have only increased in favor of consumers reading and trusting online reviews over the years the survey was conducted. In our course, we’re going to teach you the best methods for reaching out to customers in order to garner positive reviews. According to Reevo, having online reviews results in an 18% uplift in sales. Adding reviews to your “digital portfolio” could be one of the easiest methods to increase sales! We’ll also share some strategies for reputation management, i.e. what to do when you get a bad review. 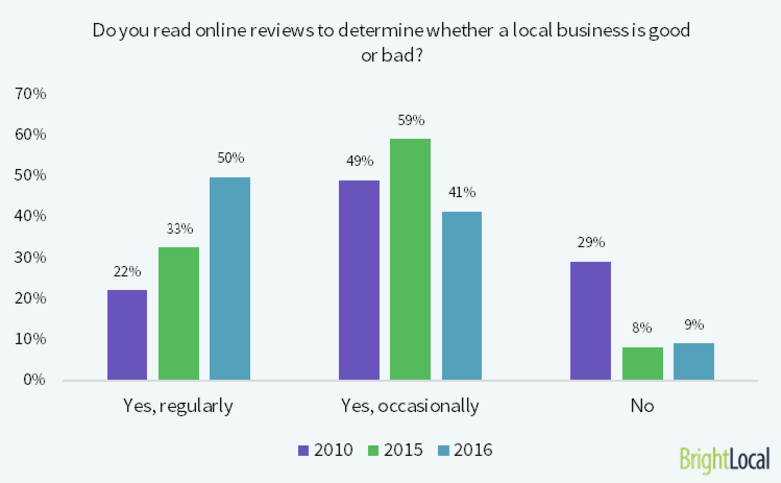 Tying this all together is that for 54% of respondents in the Bright Local survey, the next step taken by consumers who read a positive review is to visit the business’s website. 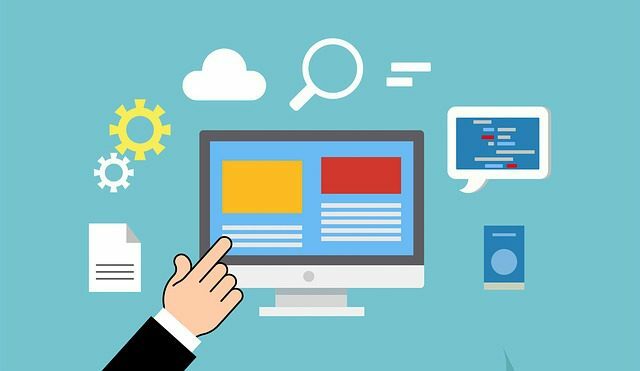 While creating a website cannot be considered easy by most of us, this seems to be the next logical step for businesses who do not yet have one. In our course we’ll share with you the best tools on how to create a website, as well as give you some of the basics to get started in designing your own site. While a vast amount of good information exists regarding the topics we’re going to cover in our course, few resources/websites have broken down the steps necessary to market a business from the perspective of a small business owner. Even fewer have created their content in a systematic fashion in order to take small businesses from point A to point B as quickly and efficiently as possible We have sifted through all the information that isn’t applicable or practical for small businesses. Finally, we help you make the changes to your online presence in a hands-on fashion, considering your business’s unique circumstances. If you can’t join us in-person in La Grande, Oregon, you can follow along with the articles, video, and audio presented on this site. We’ll pick it up next time to discuss Why Google My Business is Crucial for Small Business Success. In the meantime, please answer the question: What’s been your biggest challenge in marketing your small business online? Leave a comment below and we will address your challenge in the course! Sign-up for an account over at the Hubspot Academy. Then, you’ll want to enroll in the Hubspot Inbound Marketing Course. Watch the Introduction as well as the first series of videos: Essentials of an Effective Inbound Strategy. Take the quiz under “Inbound Fundamentals.” Review the videos and re-take the quiz until you score 100%. Forbes: Is Online Marketing Really Necessary for Small Businesses?